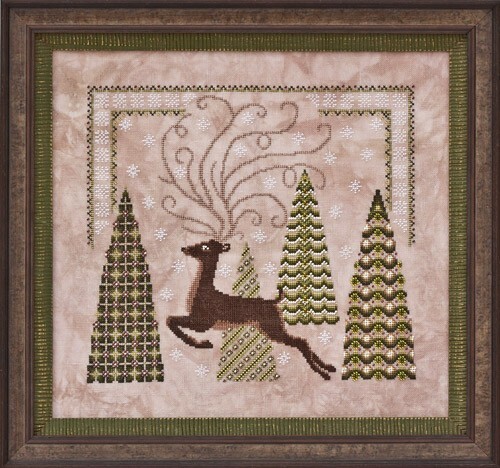 A magical deer with metallic antlers among sparkling beaded trees. Stitched with regular floss. Fabric: Stitched on 28ct “Earthen” Linen hand-dyed by Picture This Plus. Design Area: 12″w X 10-5/8″h. Fibers: A total of 11 colors of Sullivans floss, 2 colors of Kreinik #4 Very Fine Braid, and 4 colors of Mill Hill Beads were used in the model. DMC and Anchor comparable colors are also provided.